An impressive blend of bold elegance and stunning performance. The striking two-tone paint scheme emphasises its magical attraction. As sleek and elegant as the original. A real masterpiece of craftsmanship – consisting of 1,104 individual pieces assembled by hand. 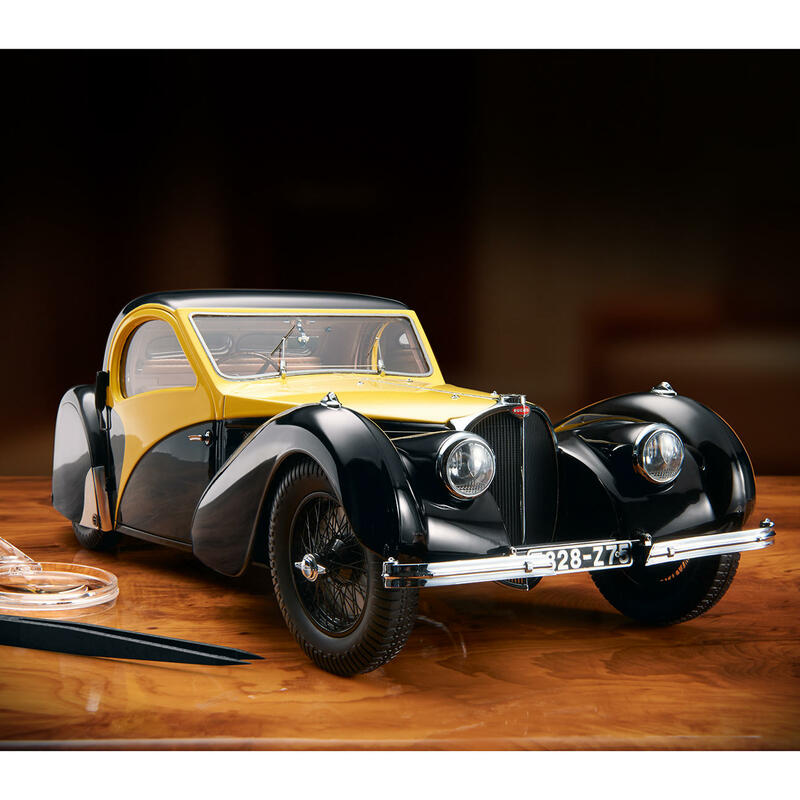 The renaissance of a legendary automobile: The Bugatti Atalante Type 57SC in scale 1:12. Model car of the year 2015, limited to just 500 copies. Heavy, true-to-detail design by the renowned German workshop Heinrich Bauer. 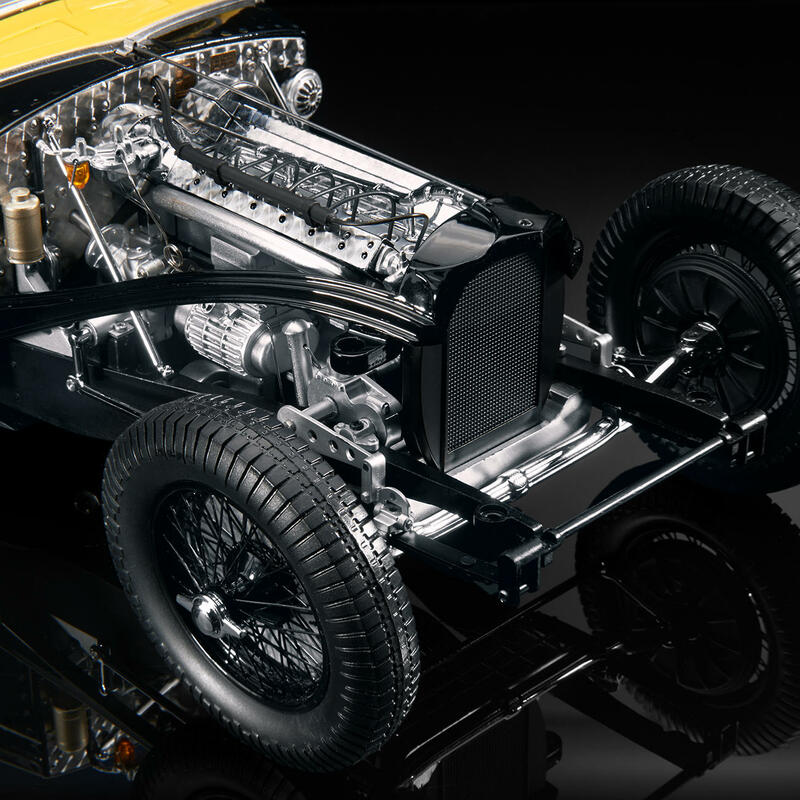 In the1920s and ’30s, the automotive industry experienced a unique breakthrough. This resulted in automobiles of unsurpassed beauty and power – including the legendary Bugatti Atalante Type 57SC. This vehicle had the chassis number 57542 and was one of only 17 cars ever made with this chassis type. 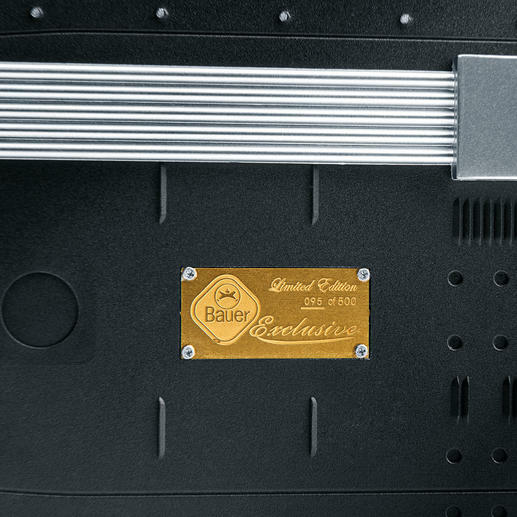 And only two copies were delivered with a compressor: The 57542 is one of them. This limited edition model is made to the exact template of the original historic treasure. 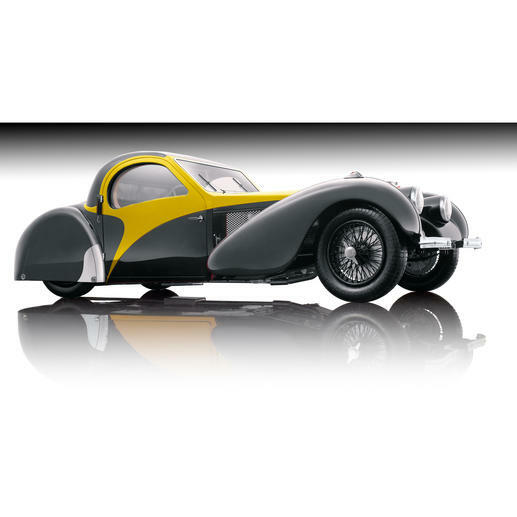 Consider the sleek proportions that Jean Bugatti (son of founder Ettore) gave to the mighty two-door car. Low to the ground, with elegantly curved mudguards and stylish black lacquered spoke wheels, the body is still considered to be one of the most beautiful bodies ever produced. 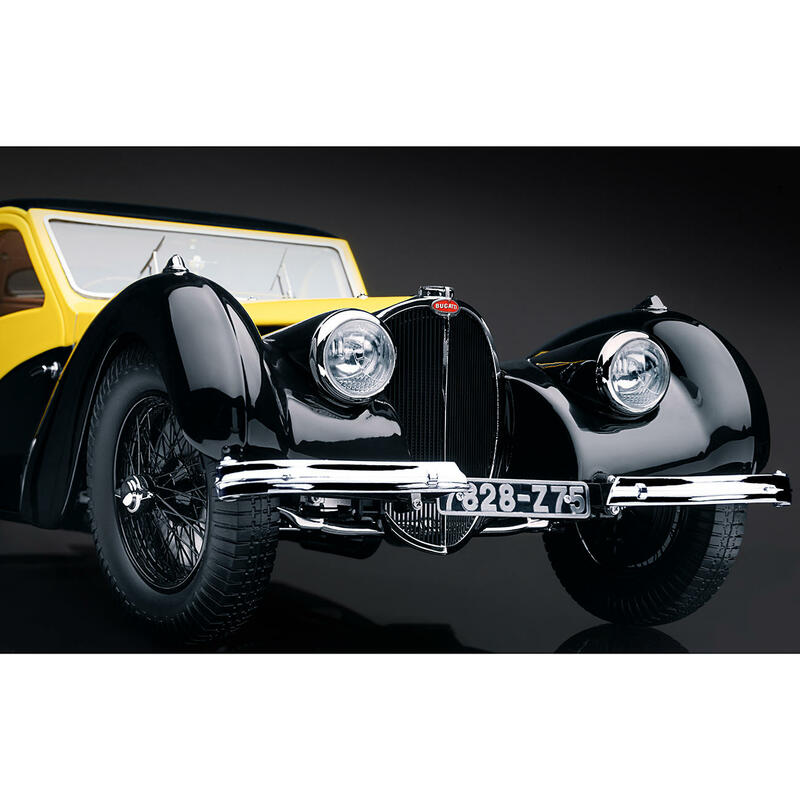 The long, stretched bonnet with a V-shaped radiator grille contains the 200hp 3.3 litre engine. The top speed of the coupé was 225km/h, which was sensational at that time. The Bugatti became for many the ultimate sports car of the 30s. 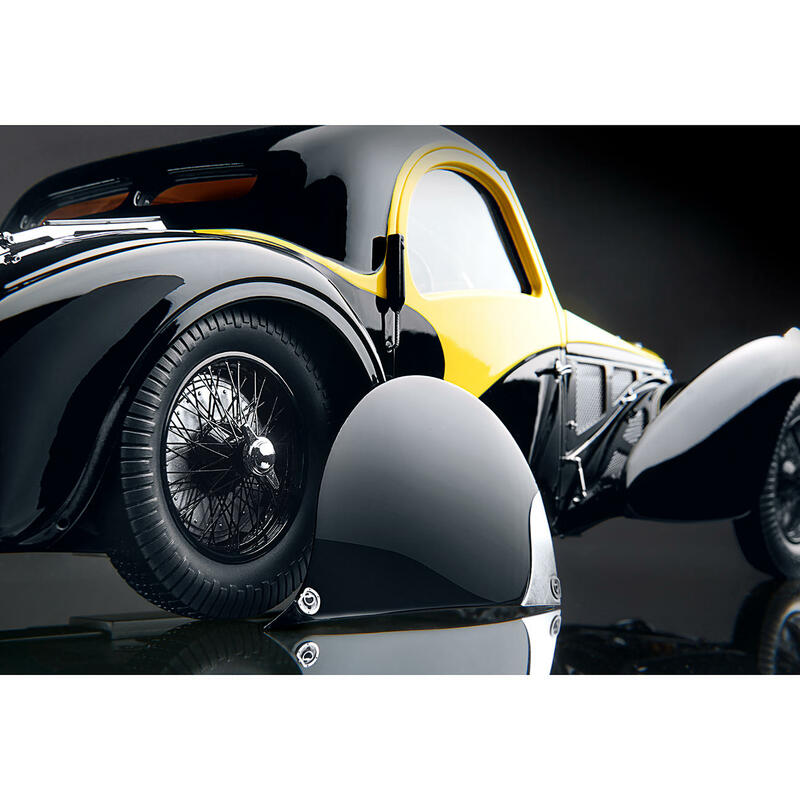 Like a concert piano, the silky smooth black gives the Bugatti a mysterious glow. 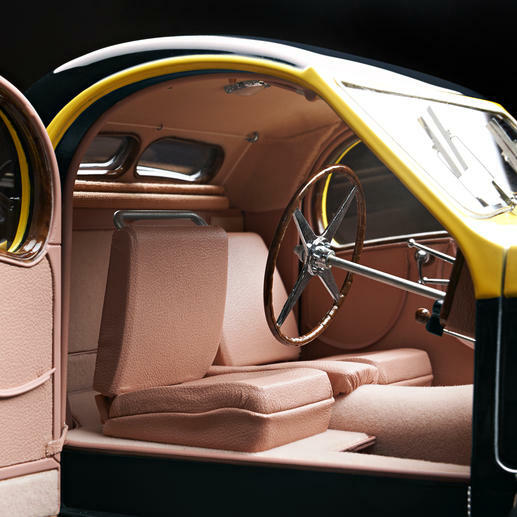 The bonnet, door and window frames are accentuated by contrasting yellow. The car body parts are made of metal injection-moulded parts. The spoke wheels feature high-profile, detachable hard-rubber tyres. The interior, with fine velour and folding seats in elegant faux leather, matches perfectly the overall design. The cockpit is a piece of art in itself with sharp-contoured instruments and a functional steering wheel. The hinged radiator cap provides insight into the powerful inline 8-cylinder engine. Of course, the doors can be opened and closed, as can the boot. Even the direction indicators and ventilation flaps move, and the petrol cap can be unscrewed. In addition, an identical spoke wheel is located under the spare wheel cover. 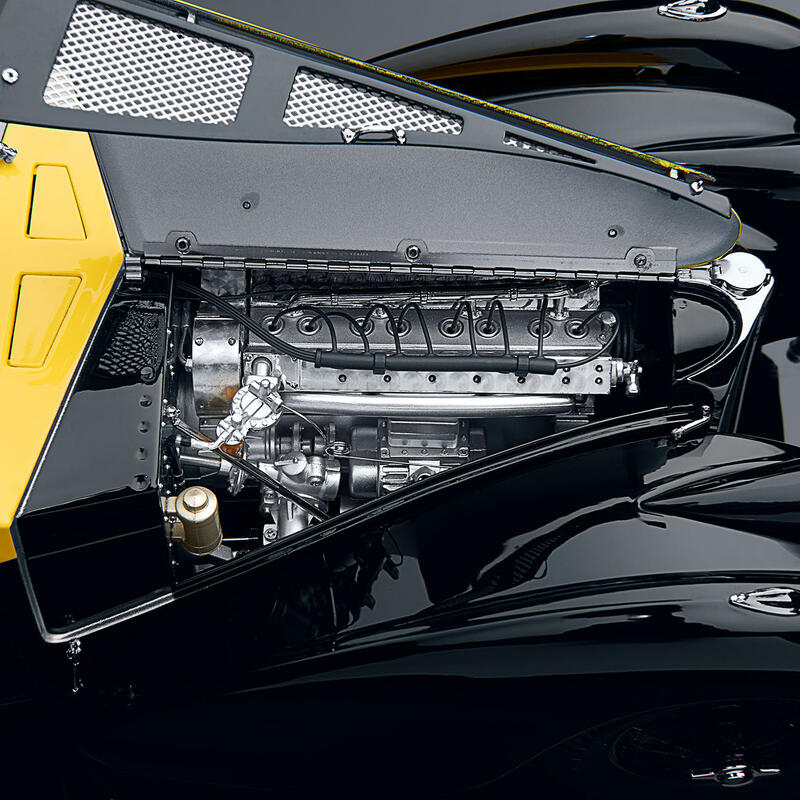 The love and precision with which the models are made is evident in every detail. Size 39 x 14 x 11cm (15.4" x 5.5" x 4.3") (L x W x H). Weighs 2.09kg (4.6 lbs). In black/yellow, limited to 500 copies. A valuable collector‘s item – also perfect for the desk and office.